The packable, portable darkroom that really holds up when the pressure is on. It's comfortably cool. It gives you the space you need to work in and is as lightproof as your favorite studio darkroom. Designed by a working camera assistant, the Harrison Film Changing Tent is packed with practical, field-tested features. The Harrison Film Changing Tent is ideal for both the motion picture assistant and large format still photographer. The Harrison standard changing tent is intended for 35mm motion-picture film or 8x10" sheet-film changing. Reflective silver fabric keeps heat out, and interior cool. A domed ceiling keeps film dust-free. Double zippered doors provide double protection. Elastic sleeves are long enough to fit over elbows, and inside elastic provides added security. Shock-corded and anodized aluminum tent poles fold into sections for storage. Box Dimensions (LxWxH) 19.7 x 6.2 x 4.8"
Standard Film Changing Tent is rated 4.3 out of 5 by 13. Rated 5 out of 5 by devisu from Best Portable Darkroom I have owned a couple of these over the years and never worn one out. The tent feature keeps the dark cloth off your hands when loading film into daylight developing tanks, sheet film holders, and bulk film loaders. Good size for use with 4X5 and probably 8X10 sheet film. Handy for retrieving jammed film without exposing it. Much more comfortable than a changing bag and probably easier to keep dirt and dust free. I travel with one so that I can develop film on the road. Roominess helps avoid scratching film when loading multiple rolls. It is a little bulkier probably than a very small changing bag. 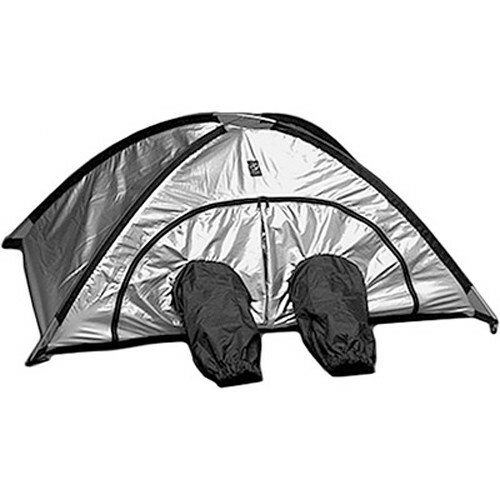 Rated 1 out of 5 by S from the tent turns sticky Warning the tent turns sticky and welds itself together after 6 months. My tent is totally usless and unusable now and the manufacturer refuses to replace it, but would like it returned for tests. They say this is not an isolated case but very common. The only thing they said they would do is sell me a new one. Very bad after sales service and bad product. Rated 4 out of 5 by David from It does get sticky and smells like... I have this exact tent for at least 11 years now (and it was bought 2nd hand so it's even older than my ownership) and I'd like to comment that it does get sticky and smells like poo... I'm pretty sure it's ageing of the special reflective material / elastics used in the cufflink because after loading the film into cassettes and film tanks; the places where the elastics constrict onto my forearms have this oily sticky residue. With that said, this tent has never failed me. In terms of functionality, Harrison makes the best of the best. I used this for 4x5 & 35mm loading of daylight tanks and also for 4x5 grafmatic film loading. The tent creates a lightproof cavity that ensures nothing collapses onto your film unlike changing bags (I have both Harrison tent and bag). I love this tent! Rated 5 out of 5 by Anonymous from Top 10 must have for cinematographers Without a doubt one of the greatest tools ever devised for the AC, the Harrison Film Changing Tent will always be on my top ten list of must have production gear. My first tent (nearly nine years old now) continues to serve me. Solid improvements to the original design make this an incredible value considering how important a changing tent is to any type of production using film to capture our prized images. My students love it! Rated 5 out of 5 by Anonymous from Far Better Than Any Changing Bag I have been using mine for about 6 years for loading 8x10 and 4x5 film holders. I've used changing bags before that and all of those are ridiculous compared to this. You'll be able to load anything much more quickly and without frustration as well as keeping your hands cooler in the process. Simple setup/takedown. I don't understand the comment of this tent getting sticky as I don't see that it is made of a material which could. An indispensable item. Rated 5 out of 5 by Threefoot from Great Quality If you are looking for a quality change tent, this is it. I purchased this for 4x5 use. For just changing film holders this is probably overkill, I probably could have gone with the smaller one, but I wanted the ability to do larger size or drums some day, so I purchased this one. Great choice as there is plenty of room. If light weight and small footprint is essential get the smaller one, can't beat the quality. I am very happy with my purchase. Rated 5 out of 5 by llamas for me from Yes it does get sticky, but... I had my tent for about eight years. Yes, it does get sticky and the silver coating started to delaminate, but I believe the fault really rested with me. I had packed it in my car roof cargo box where it gets very hot. The fabric stuck to together and shortly after I started having problems. DO NOT STORE THE TENT IN PLACES WHERE IT GETS HOT. FOR LONG TERM STORAGE, STORE THE TENT IN A COOL DRY PLACE IN A LOOSE COTTON BAG LIKE YOU WOULD STORE A DOWN SLEEPING BAG. Rated 5 out of 5 by mmmtanji from Film Changing Tent Excellent changing tent. Better to use rather than a changing bag. It rolls up into a bag. When stored in the bag it's about 16 inches long with a 6.5 inch diameter. Hope this helps. Does it have enough room for changing 8x10 negatives? Yes. That's why I got it. However it's tight. If you're trying to load a developing tank it might be too small. I am able to load/unload 8x10 holders and put film back into boxes. The next size up would definitely be good.